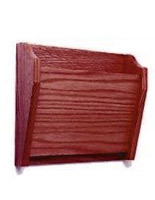 Are you shopping for a wood wall file pocket to replace an old, dented metal holder? This hanging organizer is a suitable replacement. 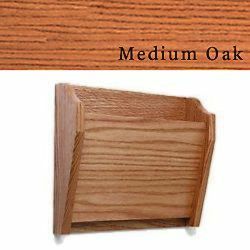 This slanted wooden holder, wood wall file pocket features a medium oak finish that will complement the other fixtures within a medical facility or business office. The sides are made with solid oak, while the front and back panels are laminate. 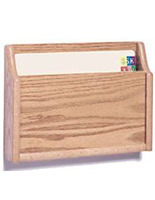 Each wood wall file pocket features a slanted design that makes it easier to retrieve folders. 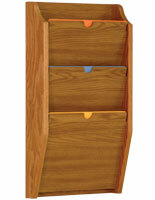 Doctor's offices use this hanging organizer to store patient records that are expected for the day. This wood wall file pocket, also called a mounted folder holder keeps private information off of desktops and out of view from passersby. The high front panel provides an ample covering of the folders contained within the unit. 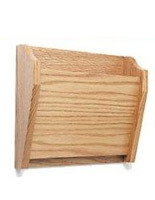 This wood wall file pocket is simple to install. The necessary hardware is included. Each wood wall file pocket holds up to .75" of material. 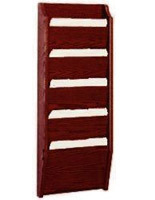 This hanging wooden rack can also be used as a literature holder. 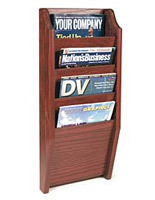 Place this wood wall file pocket in a waiting room or reception area to offer patients and visitors free reading material. The extra wide construction can accommodate two standard sized magazines with a slight overlap. 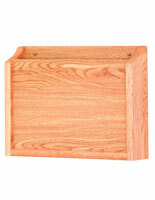 Purchase this wood wall file pocket in larger quantities to take advantage of the discount pricing!